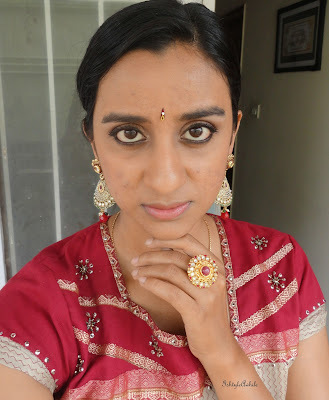 There is no way that my festive special posts could be complete without a makeup look. 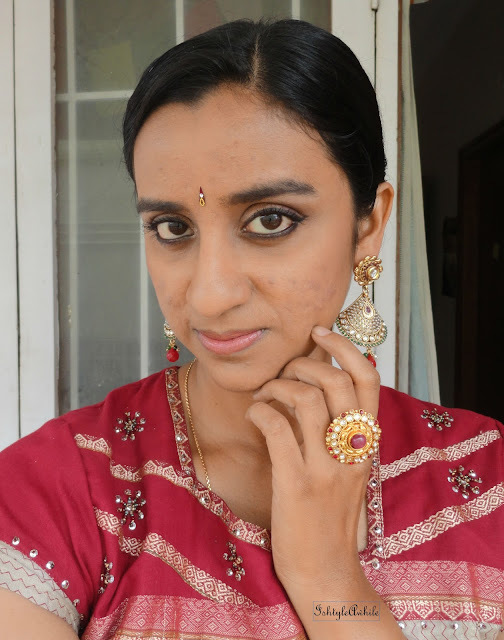 So here is a simple neutral eye makeup look that can be worn with multiple lip colours. All of the eyeshadows are from the Coastal Scents revealed 2 palette. 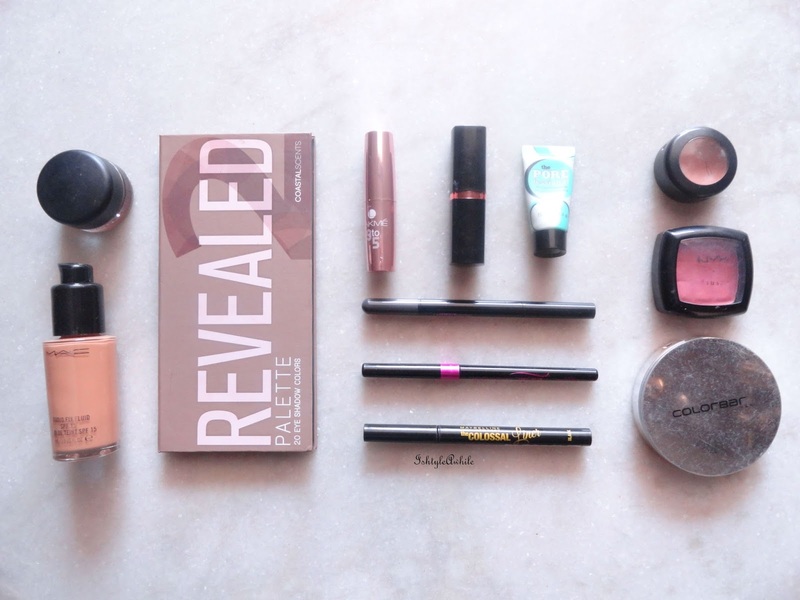 Such a gorgeous palette. It is really the best buy ever. 1) Since it is for the festive season, go for a primer, like Benefit Porefessional, apply it gently with your finger tips and allow it to settle. In the meanwhile let's move onto the eye makeup. 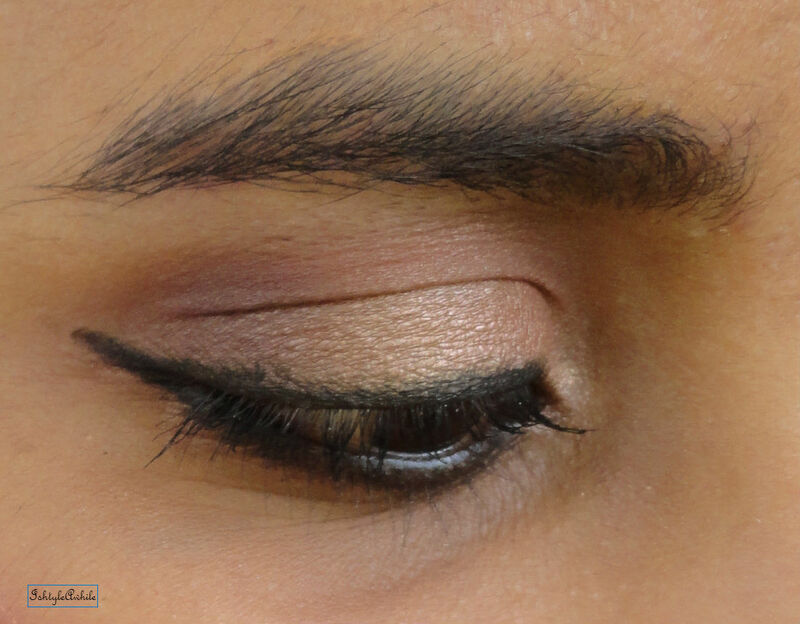 2) Choose a cream eyeshadow as the base. I used the MAC paintpot in Indianwood. You could use just this, line the eyes and finish the look. That would be the lazy girl's way to festive makeup. But not for me. I love eyeshadows. I love blending them to create a hue of shades on my eyelids. 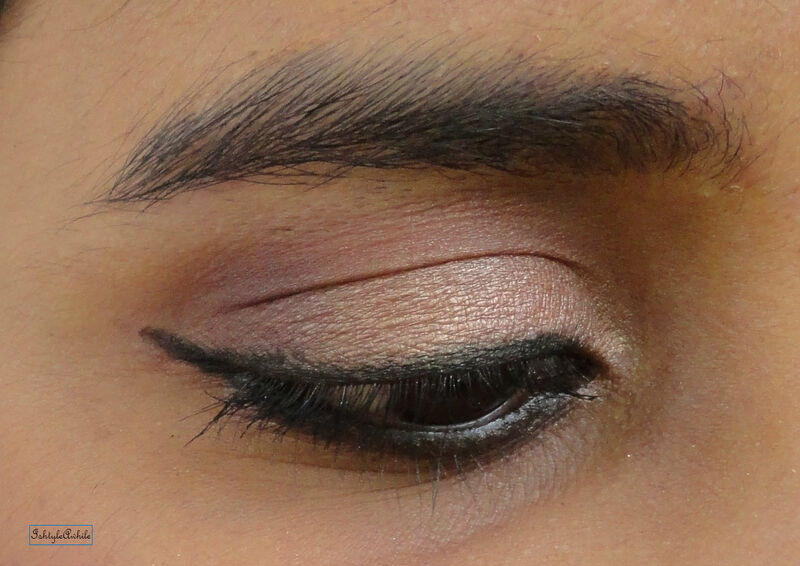 3) First I blended a taupe colour into the crease to smooth out the edges of the cream eyeshadow. Then I patted a copper colour eyeshadow over the top. Then darkened the outer edge with a darker brown to define the eyes a bit more. Using a blending brush, I made sure that there were no harsh edges and that all the colours were seamlessly blended. 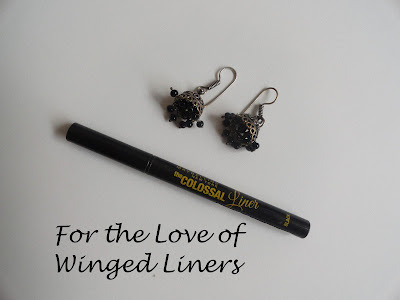 4) I lined the eye lid with Maybelline The Colossal Liner. The pen is starting to get over and so I had some difficulty in getting a smooth line. By this time the primer had set to I moved onto foundation. 5) My foundation- concealer duo is a standard combination of MAC StudioFix Fluid in NC 44 and MAC StudioFinish Concealer in NW 35. I love using the Beauty Blender to get a smooth finish. Sometimes, especially when I have some dryness, I spray the Beauty Blender with MAC Prep and Prime Fix + and then blend out the foundation. 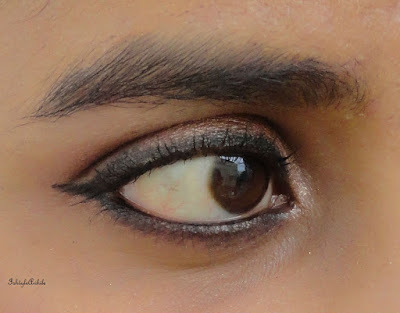 6) The eye were lined with L'Oreal Kajal Magique and using the dark brown eyeshadow from the Coastal Scents Palette I smudged it under my eyes to smoke it out. 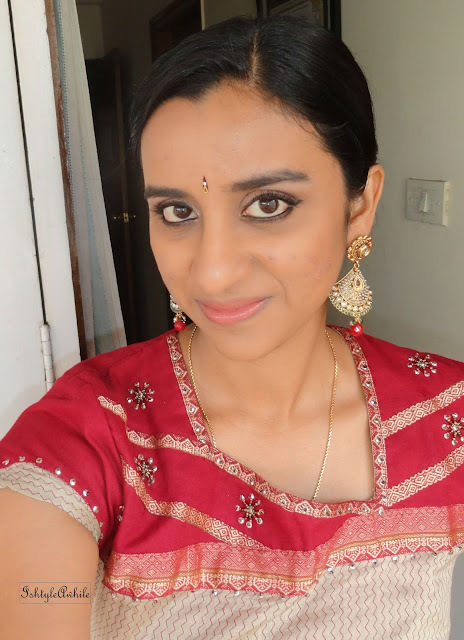 I always make sure that the kajal meets the eye liner at the corner of the eyes to make it look complete. 7) The face is now set with Colorbar Perfect Match Compact in 003. 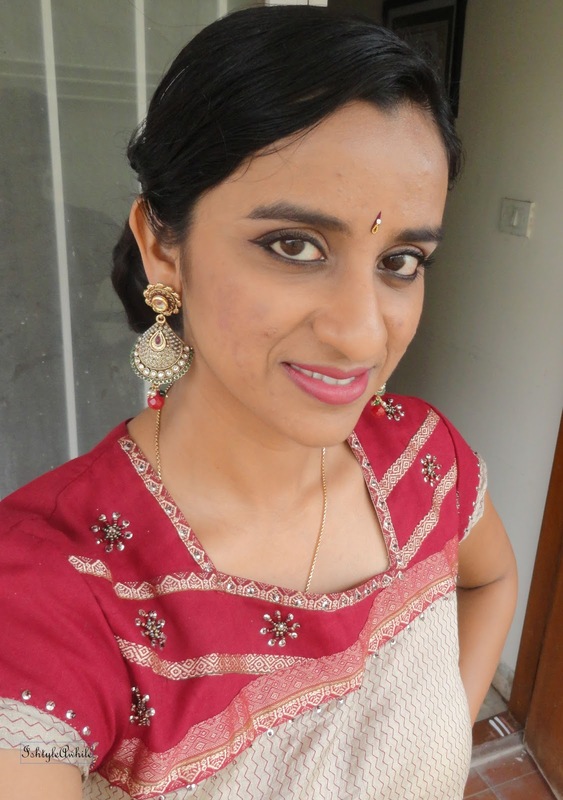 The blush that I use on an everyday basis is NYX Blush in Mocha. 8) To finish the look, I did my eyebrows with the Maybelline Fashion Brow Duo Shaper in grey. 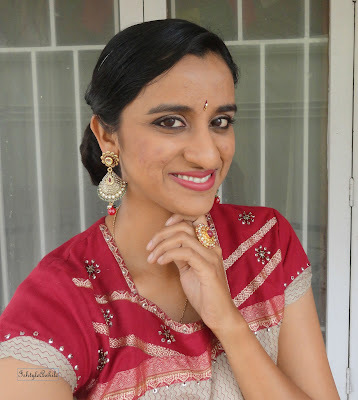 I wanted a more fuller look, so I chose grey (P.S the review for this is ready, but then I got distracted by the Navrathri series and I didn't finish editing the pictures. I will have the review up soon after this). I highlighted under the brow and on the centre of the eyelid by dabbing a small amount of a gold eyeshadow. I chose one that has fine shimmer so that it doesn't over power the entire look. 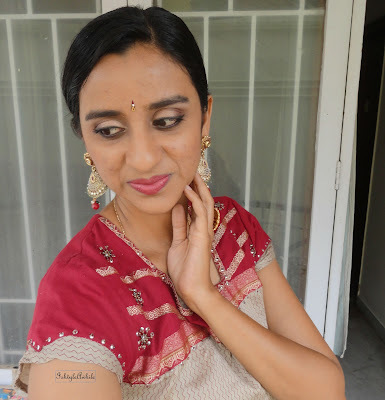 For those who would like a more natural look, I suggest that you go for something peachy brown like the Maybelline Colorshow Lipstick in Choco Latte. To amp up the festive look, you can opt for a rosy lip colour like Lakme 9-5 lipstick in Rosy Sunday. 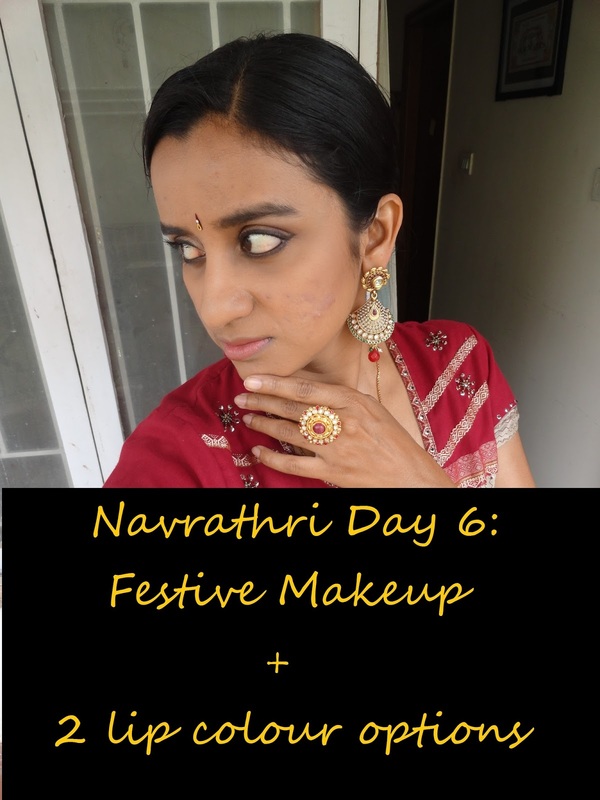 And this concludes the post for day 6, a makeup look for the festive season. What other lip colours would you pair with this eye makeup look? Let me know in the comments section below.